Here's a rather unlikely internet celebrity - one who has probably never used a computer. 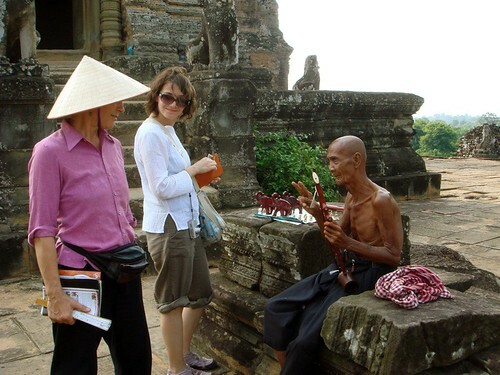 Antoaneta and I met this very old chap selling small statues on top of magnificent East Mebon at Angkor Wat. I bought a tiny brass Buddha and I took a photo, of course. For effect, he lazily sawed out a few musical notes into the heavy, humid afternoon air. Since then, I've explored the Flickr photos of hundreds of other people who have visited the temple. That familiar character continues to appear in many photostreams. 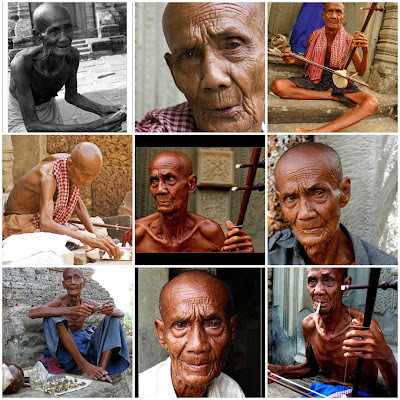 Most of the photos' captions make reference to the man's age and wonderment at what he must have witnessed in his lifetime - he makes a deep impression on foreigners as he seems to be a living artifact of Khmer history.